The sun just unleashed its largest solar flare in over a decade, causing radio blackouts. NASA recorded the powerful radiation burst early Wednesday morning that left the sunlit side of Earth with "wide area of blackouts for up to an hour." Low-frequency communication like the kind used for navigation was also affected for an hour. Scientists say the same region of the sun also produced smaller flares afterwards that could damage satellites, communications and power systems. On Feb. 24, 2014, the sun emitted a significant solar flare, peaking at 7:49 p.m. EST. NASA's Solar Dynamics Observatory (SDO), which keeps a constant watch on the sun, captured images of the event. These SDO images from 7:25 p.m. EST on Feb. 24 show the first moments of this X-class flare in different wavelengths of light -- seen as the bright spot that appears on the left limb of the sun. Hot solar material can be seen hovering above the active region in the sun's atmosphere, the corona. Solar flares or not uncommon but one this size hasn’t been recorded since 2006, according to NOAA and the Space Weather Prediction Center. 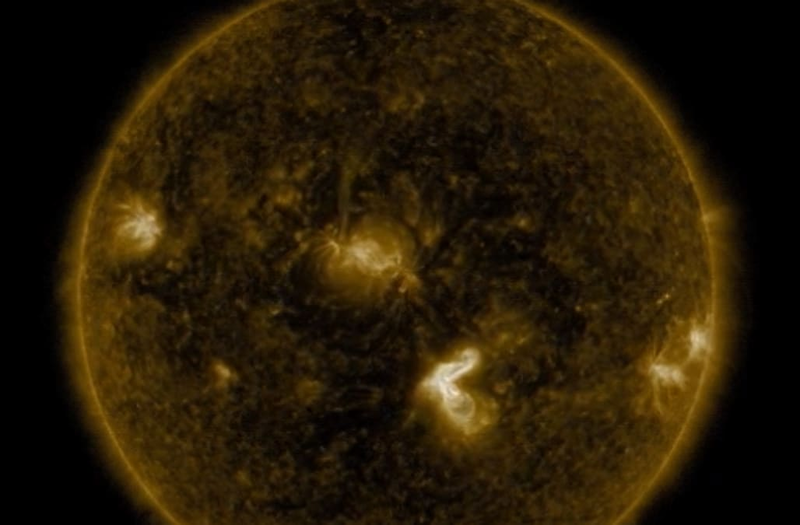 And while the event is somewhat strange as the sun is in a period of minimum solar activity, SWPC space scientist Rob Steenburgh says "These kind of events are just part of living with a star."